Cruise tourism Cruise tourism will be at its peak this month with a handful of luxury liners set to call at Kochi till April 25. The Tourism Department officers are optimistic about this, since the cruise tourism industry was going through severe crisis due to the flood last year. According to authorities, as many as 12 cruise liners carrying more than 10,000 foreign nationals would be arriving in Kochi this month. Kochi has also become one of the prime cruise destinations in India taking into consideration the number of cruises reaching here in the current season. The cruise liners to arrive in Kochi in April are Marella Discovery, Costa Luminosa, Costa Venezia, MSC Splendida, Celebrity Constellation, CMV Columbus, Silver Shadow, Albatros, Explorer of the Seas, MS Europa, Oceania Nautica and Aida Bella. The cruise season will come to an end with the cruise Spectrum of the Seas to arrive on May 11. Most cruise liners spend a day in Kochi before setting off to other destinations. Costa Venezia can accommodate more than 5,000 tourists and it is expected that more than 3,000 tourists would be arriving in Kochi. 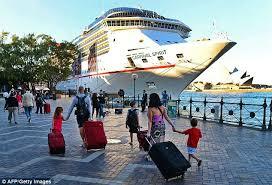 Last season, 42 cruise ships had made Kochi the port of call bringing in 48,000 tourists. There have been 30 facilitation counters for immigration clearance at Samudrika once the cruise liners arrive in Kochi. Customs, Police, Tourism Police and CISF authorities are also posted at the port for assistance of tourists.